A New Term at PaperWorks Co.! Hello! Sorry my postings have been so sporatic! I've been working on DD projects when I can, plus, now that it's summer I have all the kiddos home and they keep me busy! Stamp: PWCO/RAM Whoo Loves You? You know I love your work Kerri! PWCO is very lucky to have you. Hugs! Too cute for words, Kerri!! Love the colors, image and the whole card! So gorgeous card Kerri,I love the image and your papers..
Oh i just love your style, colors, coloring, layouts and added detail is fantastic as always...TFS! Congratulations Kerri and your card is so colourful and sweet, gorgeous! What a cutie! Your cards are always so fun :>) Yummy PP too! Love your choice of colors! This is a truly cute card. 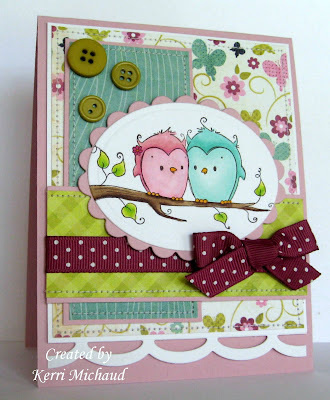 This is adorable Kerri I love all the added details! Hooray! Congratulations on your new term! You are a very-very talented girl, Kerri! I always find so much fun ideas and inspiration on your beautiful blog! Totally cute! Congrats on staying on with the DT! AWWW how super CUTE!!!!! Those birdies are darling and love how you colored them, sooo fun!!!! Super cute image and the color scheme is lovely! Fab card! these little birds are so cute!! lovely colour scheme too!